At times it can be a challenge to inspire children to have the drive and confidence to independently initiate writing. It is crucial that they are given contexts, purpose and meaning for their writing; after all, as adults we never write anything without a reason. I have found that using role-play areas provides the excitement and stimulation for children to write naturally, freely and with purpose. 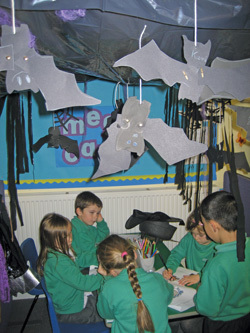 In a role-play area children can let their imaginations go and be in control of the direction and purpose of their writing. The role-play area is also wonderful for igniting the spark to being a ‘real’ writer – writing with passion, excitement and conviction. As that spooky time of year approaches, I decided to utilise Halloween to full effect by capturing the children’s imaginations through stories and role play. Together we spent days studying Halloween-linked texts, from the classic Meg and Mog books by Helen Nicoll and Jan Pienkowski (Puffin) through to the more recent Room on the Broom by Julia Donaldson and Axel Scheffler (Macmillan Children’s Books, ISBN 9780333903384). As the children listened and responded with great enthusiasm and imagination, we explored the spooky language, characters, rhyme, rhythm and settings through guided and shared reading. This culminated in some wonderful story sessions and activities, with the children excitedly joining in with sound effects, taking on character roles, and using props. Retell stories, ordering events using story language. Listen with sustained concentration, building new stores of words in different contexts. Explore familiar themes and characters through improvisation and role-play. Wow these ideas sound just great – I am a student teacher & am looking to carry out my research project based on improving literacy through role-play in key stage one – your ideas have confirmed to me how important this area is for children in key stage one! Thanks!! how enthusiastic you are – great to read and adapt in my class. I am looking to develop boys writing and would like to introduce free/independent writing into a fairly structured year 1 class. This will be my first class as I am an NQT. Your ideas sound great and I am already thinking how I can adapt this for my own children boys and girls. Thanks.